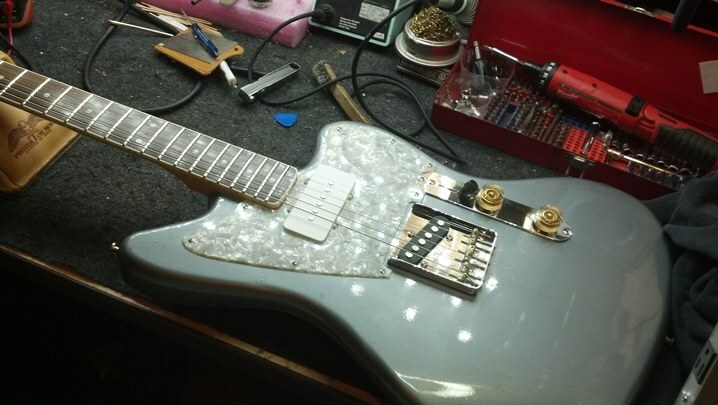 This offset-waist project guitar is playable and is actually very cool. The owner had ‘gotten in over his head’ and broken a few screws and buggered a few others. 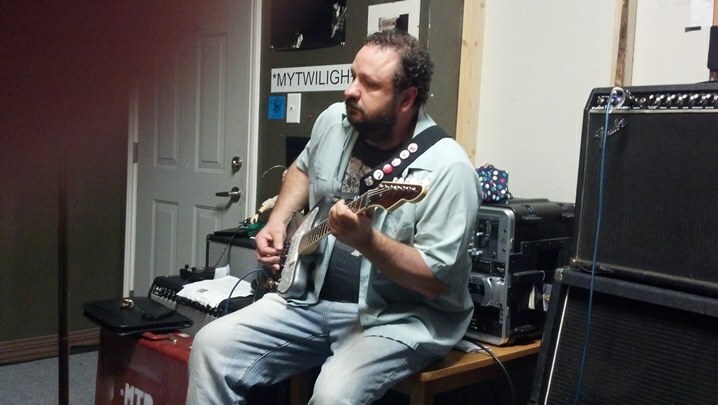 Could the Unbrokenstring Crew whip this instrument into shape again? 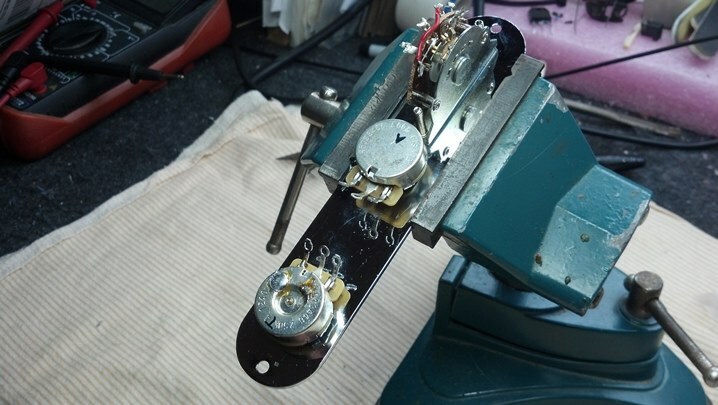 The easy part is to install gold Gibson speed knobs on the controls. There are a lot of good parts in this instrument. Looking more closely, the neck pocket will need some serious attention. What’s going on here? This is what’s going on. 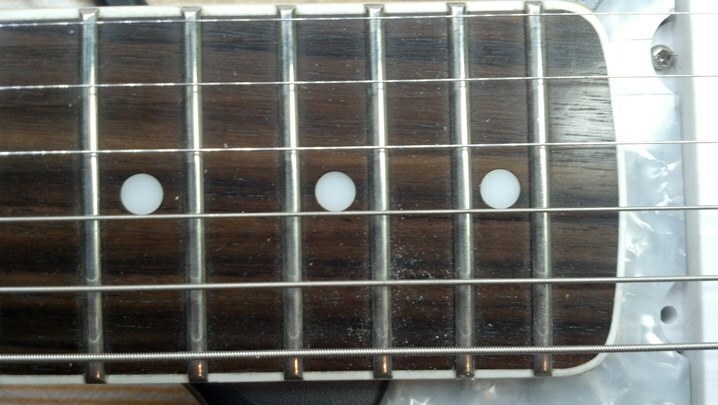 If you look at the high and low strings, you will see that they are not the same distance from the edge of the fret board. 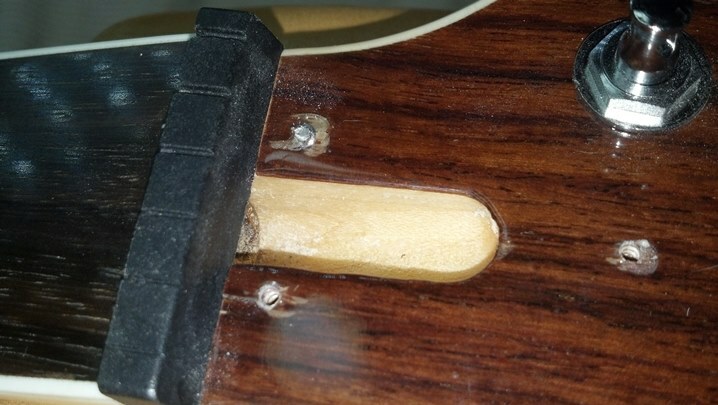 This neck is not lined up with the body of the guitar. 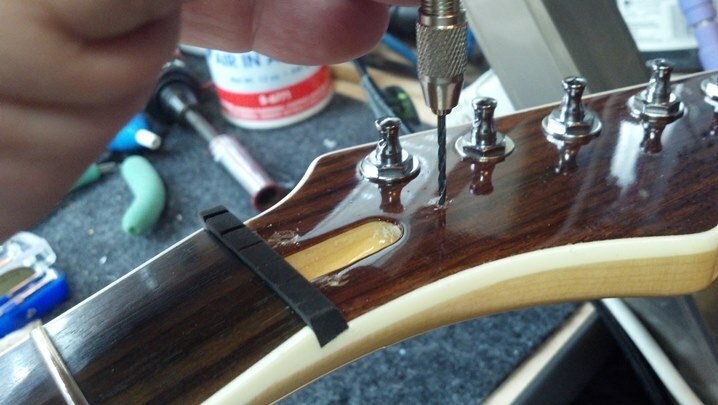 It is easy to remove the truss rod cover because these screw heads are already sheared off. 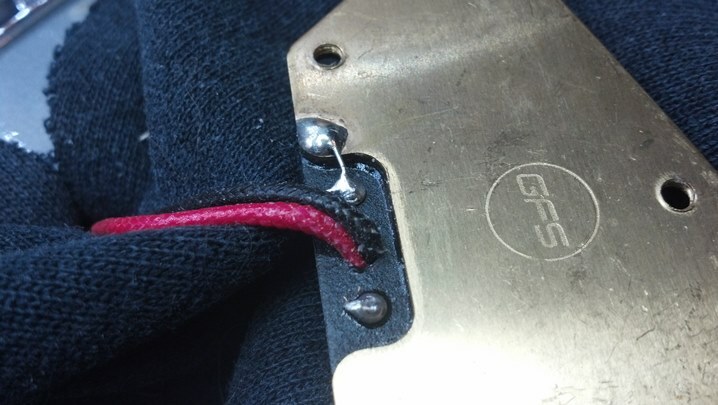 The heads of the screws around this pickup were mangled to the point that a regular Phillips screw driver would not engage them anymore. 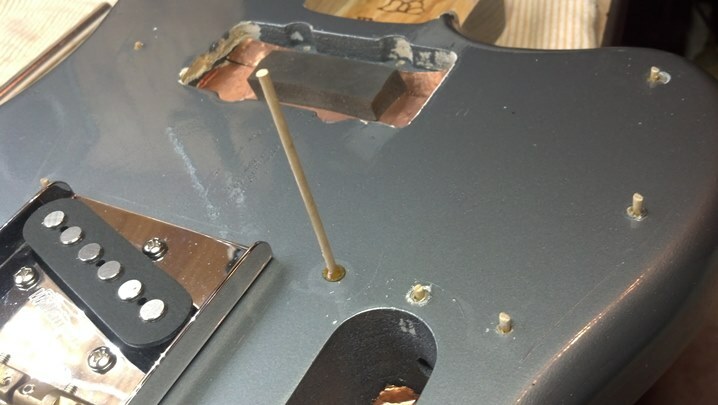 Here we’re using a pair of cutters to twist the screw out while a magnet serves as a sentinel to keep pieces of metal that will inevitably shave off the screw head away from the magnet in the neck pickup. Wow these are long. These go most of the way through the body. We are still working on this one. This is really tough. Note that the head is chewed up pretty badly. New screws are already in stock. No springs or tubing are underneath this pickup, bur rather a chunk of too-thick too-hard foam. Now we know where this body came from! 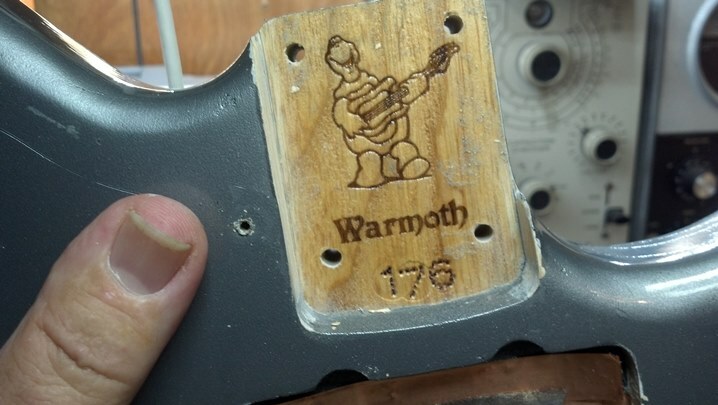 And the neck is from Guitar Fetish. Here, I marked where the body ends with a dotted line. More on this later. 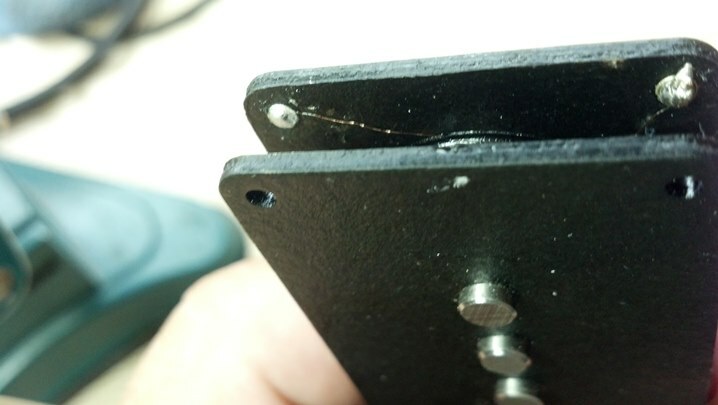 So what can we do about these broken screws? 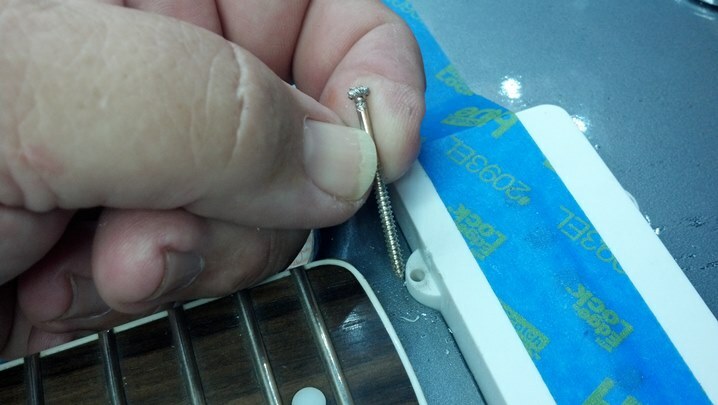 No problems removing the tuners… these screws were busted off as well. 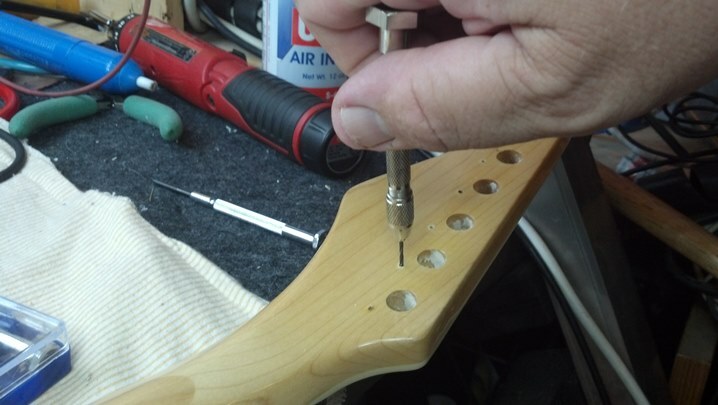 To remove the broken screws, we apply heat to the body of the screw. 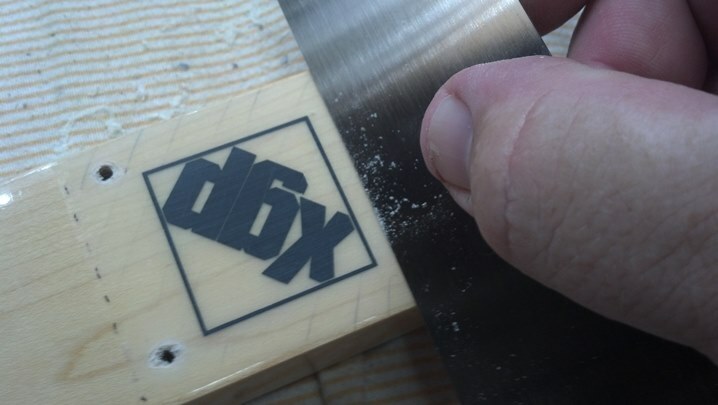 This dries out the surrounding wood so that it shrinks slightly. I used the same technique with the wire cutters to grasp the body of the broken screw to twist it out easily. Rinse and repeat for the remaining broken screws. Now that everything is apart, I need to fix this neck pocket. First, we get the bottom flat. Then we get the sides flat. This body was painted after it left the factory, so we have plenty of over-spray in the neck pocket that we need to clear out with this scraper. I believe that we are down to real wood again. 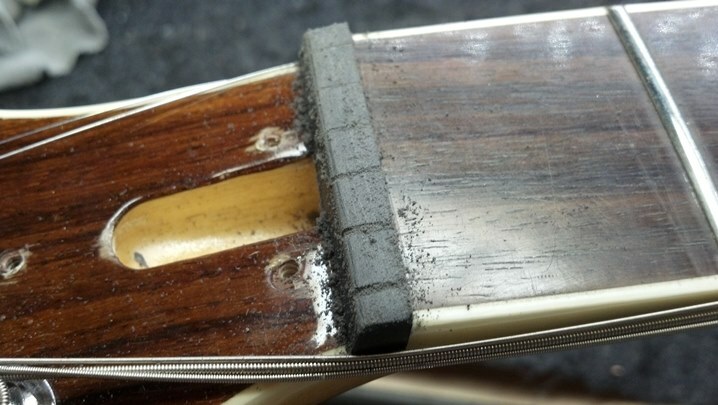 Acoustic coupling occurs best when the neck and body fit tightly, ‘bone on bone,’ if possible. 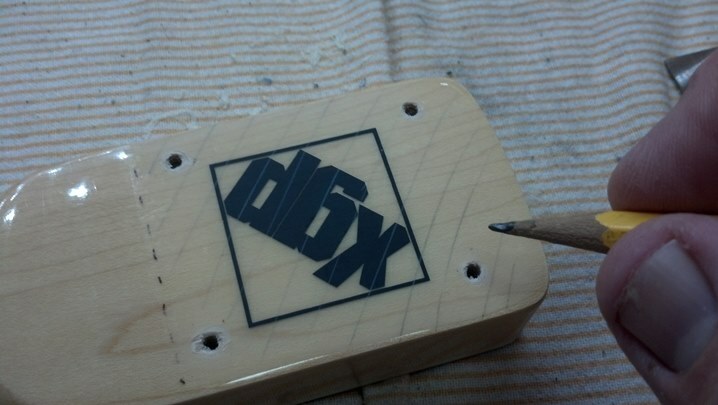 I really like this wood hardener, which is essentially solid Lexan dissolved in a light solvent. 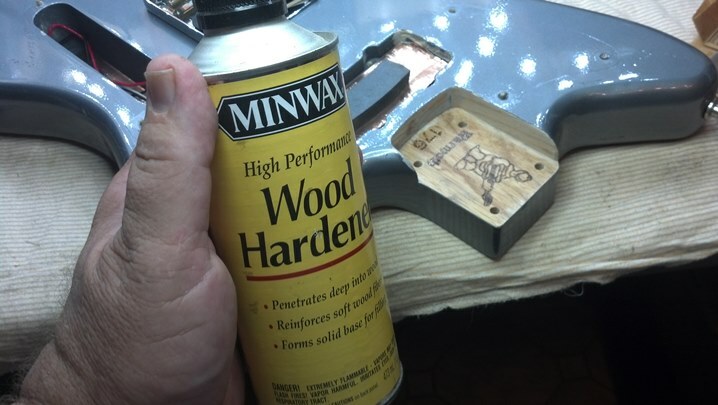 This raw wood will take a few coats to seal and harden. As the old cowboy on the cattle drive once said, “Be sure to look back to see if the herd is still behind you.” Periodic fit checks are always a good idea. 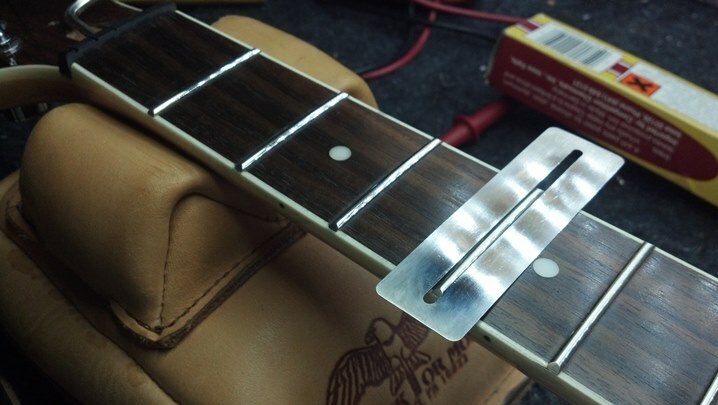 This neck is beautiful because of the thick layer(s) of polyurethane finish. 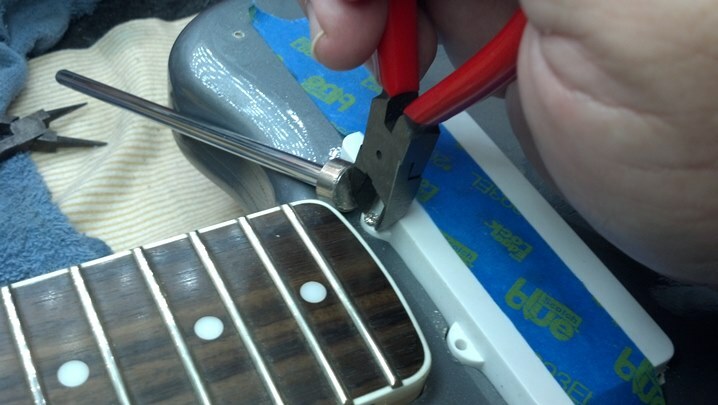 However, the polyurethane layer may get in the way of acoustically coupling the neck to the body. 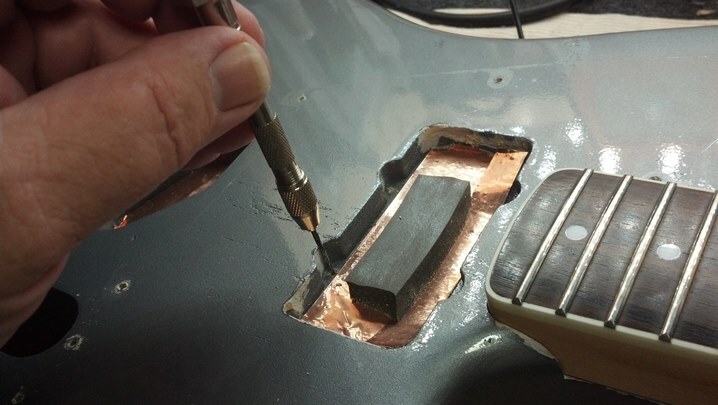 Here, I’m hatching the area where I will scrape away finish. 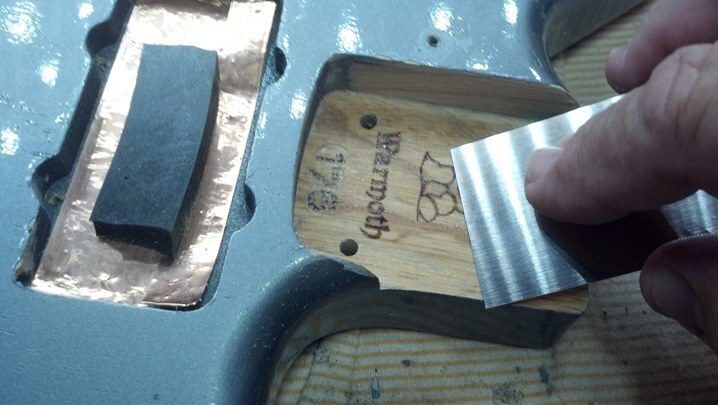 Again, the luthiers’ scraper is the perfect tool for removing finish evenly and smoothly, leaving the surface exactly flat. That is much better! 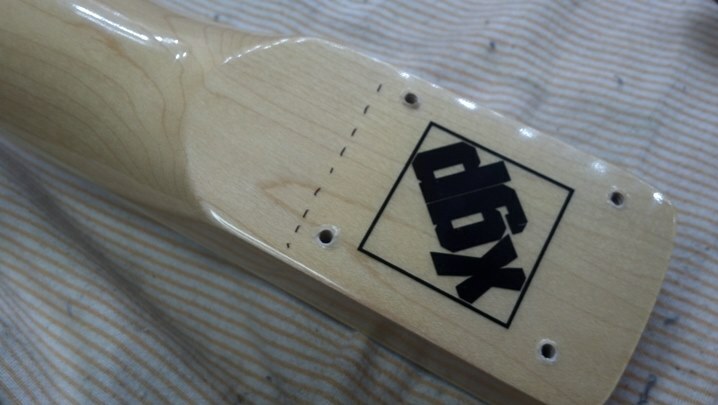 Not shown: the finish on the end and sides of the neck where it meets the body is also removed. 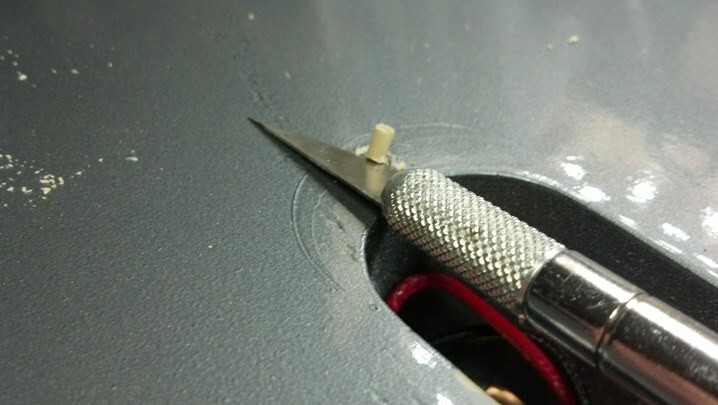 A pin vise holds the proper-sized twist drill to resize these holes for the Correct pickup screws. A little canned air clears out the cuttings from the holes. 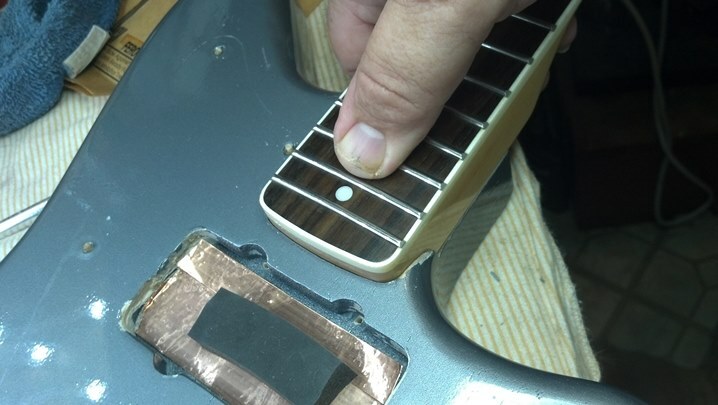 Over-sized screws held the pick guard in place. The Correct screws are smaller. 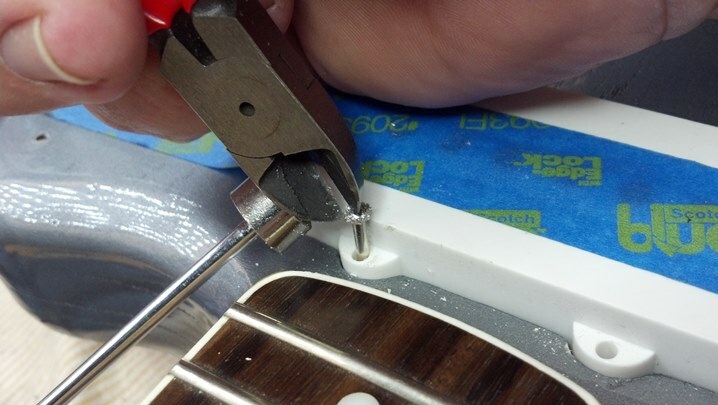 Here, a small dowel is glued into each hole, which will be re-drilled with the proper-sized hole. 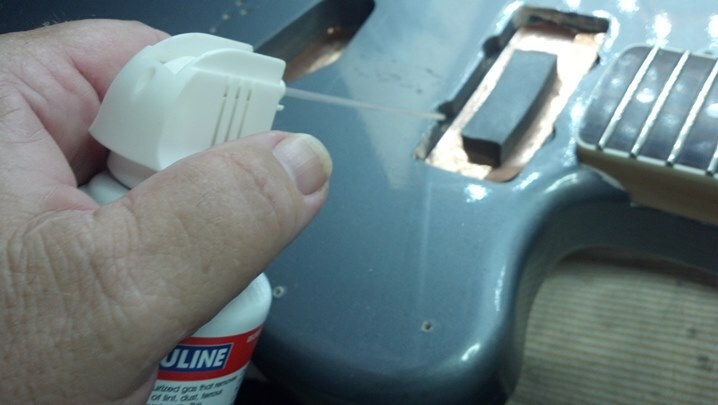 This is hide glue shown here; just fine for this duty. 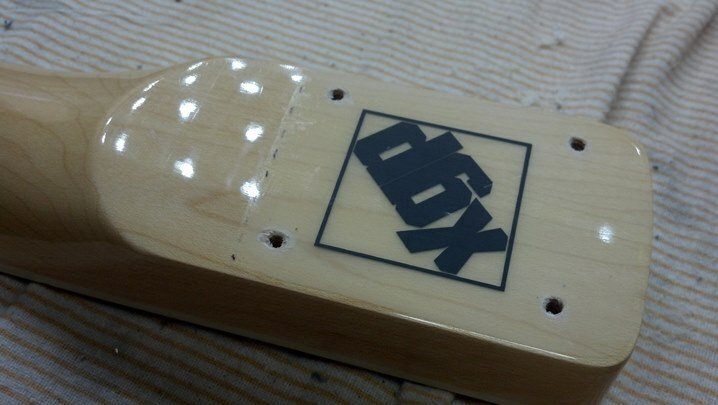 Once the hide glue is cured, each dowel is trimmed flush. 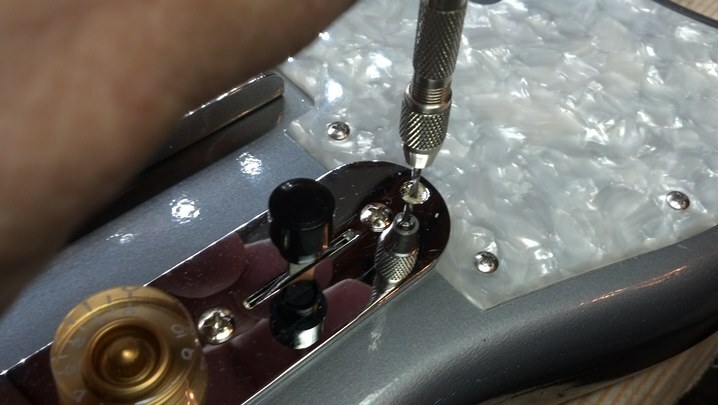 I jumped ahead to show how the Correct screws are nearly flush with the top of the pick guard. Almost factory. 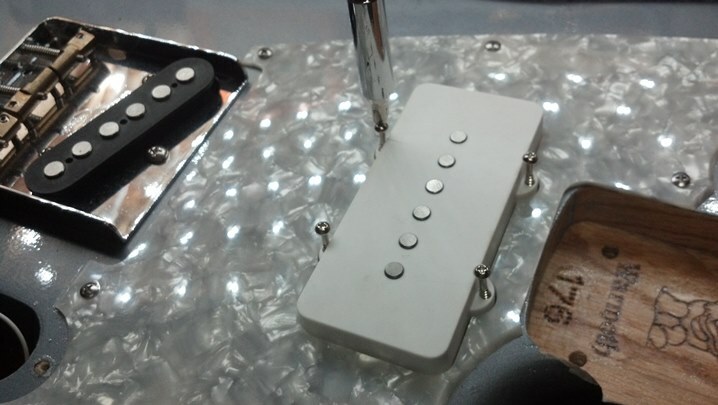 This single-coil pickup reads as an open circuit. That tiny wire is broken. The tiny wire is broken because these black and white leads can twist around. Hot-glue now holds them stationary. 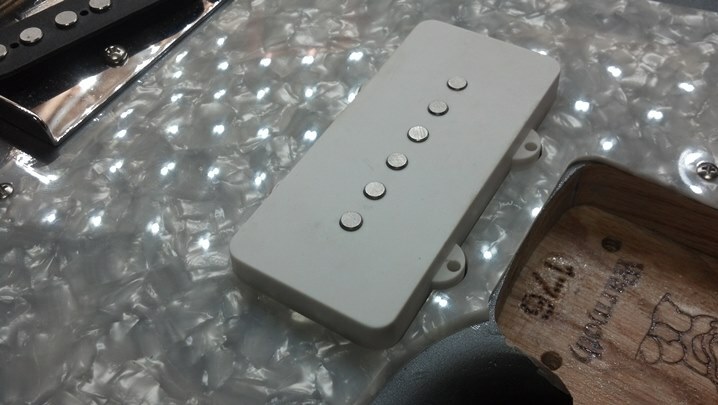 The pickup is working now. 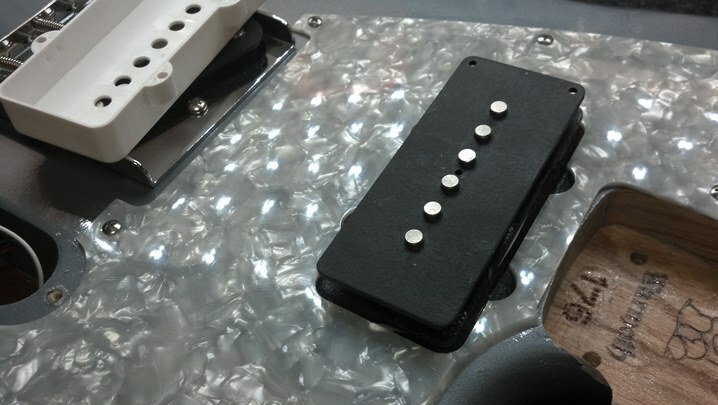 Here is some new, softer foam in place to hold the pickup in position. 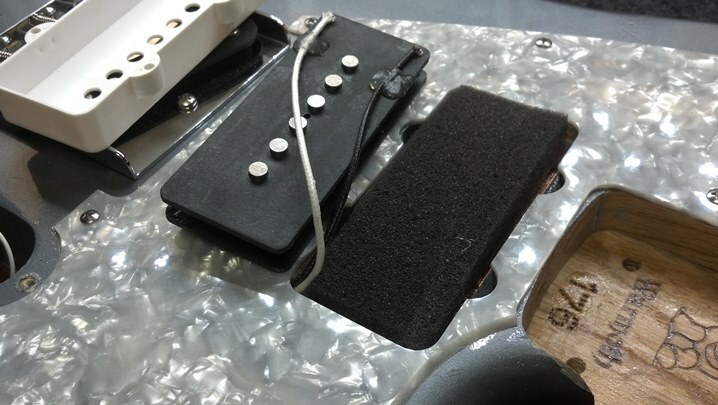 Leo Fender would have used short pieces of vinyl tubing on the screws to act as a spring, but these covers go all the way to the bottom of the cavity route, so the foam is the best option for this setup. 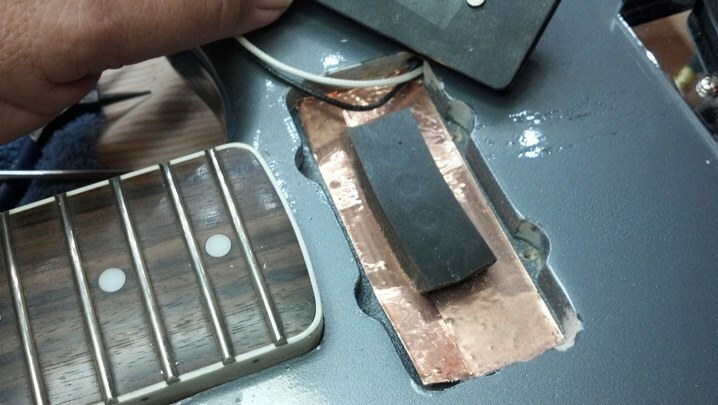 Oh, and you can’t see it, but the copper pulled out when the original foam was replaced, so this guitar has copper in the pickup route and under the pick guard. Here is the actual pickup. And here is the separate cover. The Correct screws are not nearly as hard to drive as the other screws. More Guitar Fetish goodness! 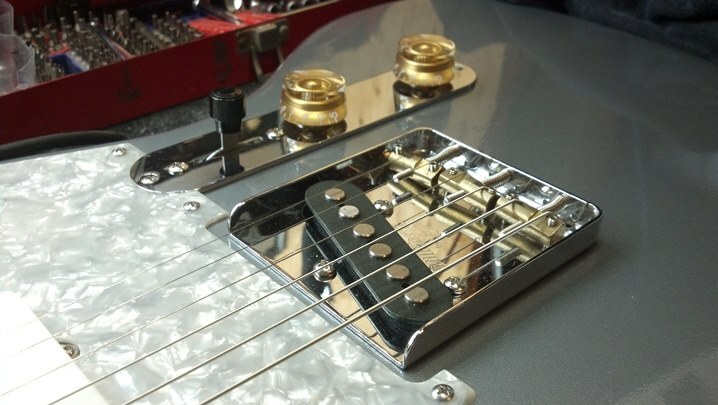 The metal parts of the guitar should be tied to a single point, not at various places along the signal path. 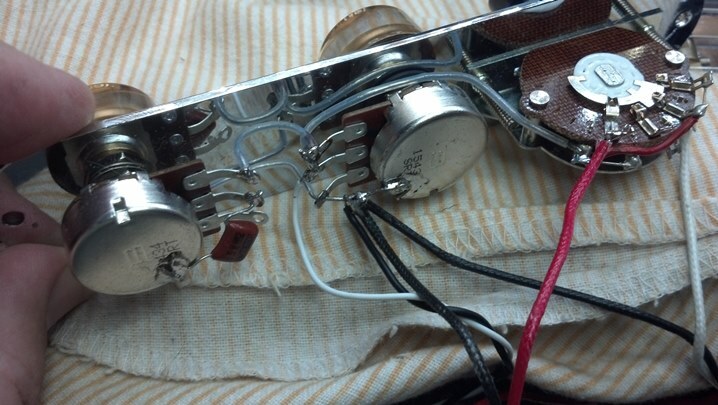 This soldered wire ties the metal body of the pickup to one side of the audio path, and has got to go. That connection is now cut open. 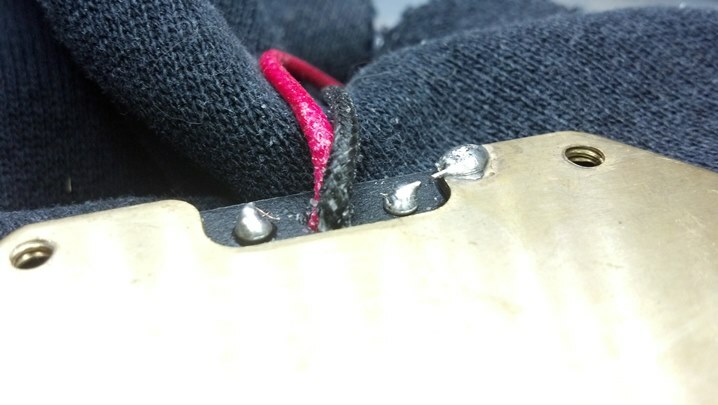 A separate layer of foil is wired to the single point ground. 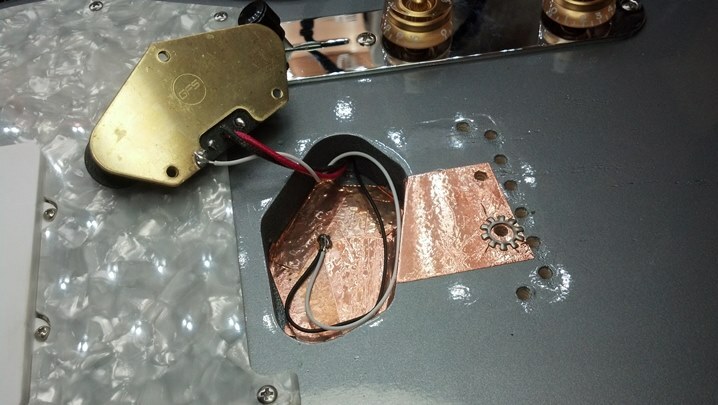 The connection to the bridge and strings is accomplished with another sheet of foil and this outside-star lock washer. Again, the mechanical ground is not part of the signal path. Everything goes together as it should. 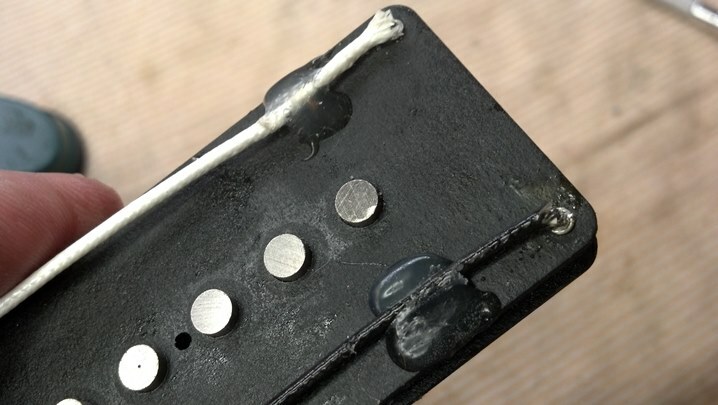 See how the star washer makes the connection between the bridge and foil? The Correct controls are marked T for tone and V for volume. The switch is ready to wire. The new wiring is accomplished with solid wire in Teflon tubing. 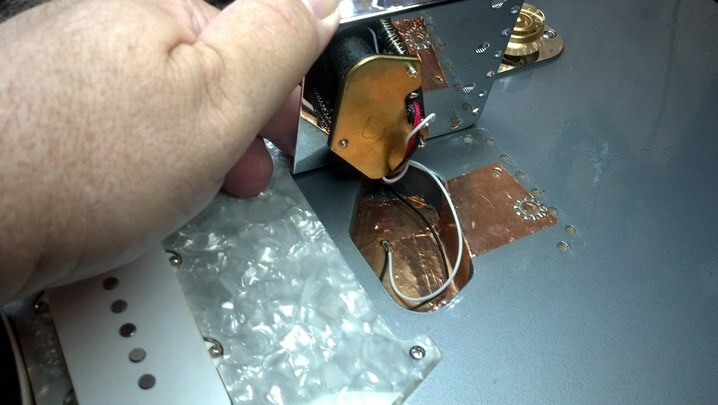 The pickup wiring is the vintage ‘push-back’ wire, which is actually really easy to use and can be very clean-looking as the insulation is cut without resorting to wire strippers. 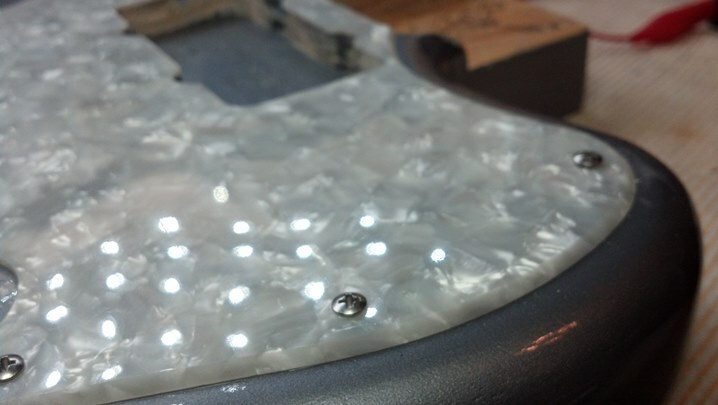 When the control plate is in the correct position, new holes are bored for the screws. 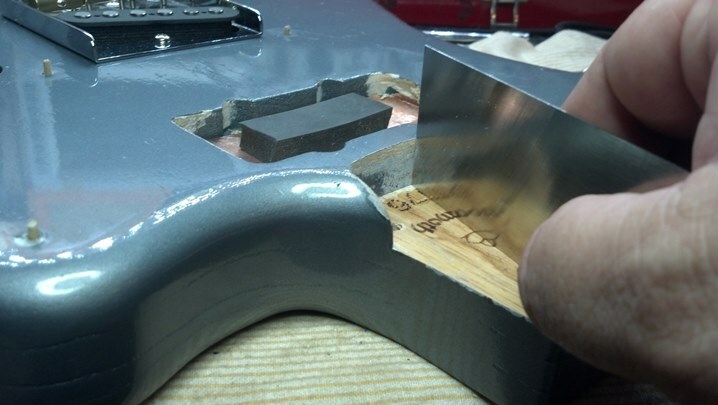 The neck plate needs some attention. 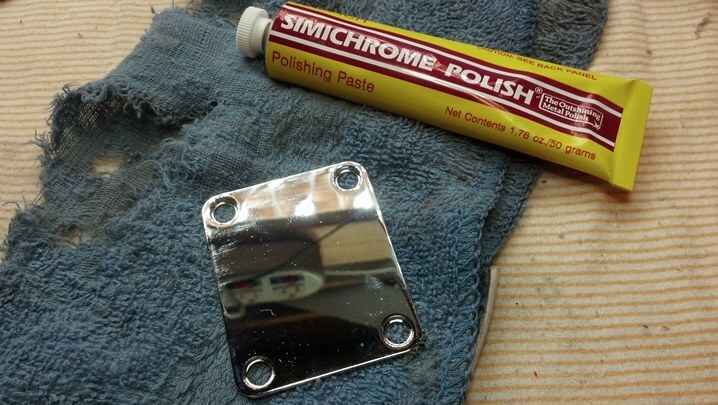 This metal polishing paste is also what I use to polish fret wire. 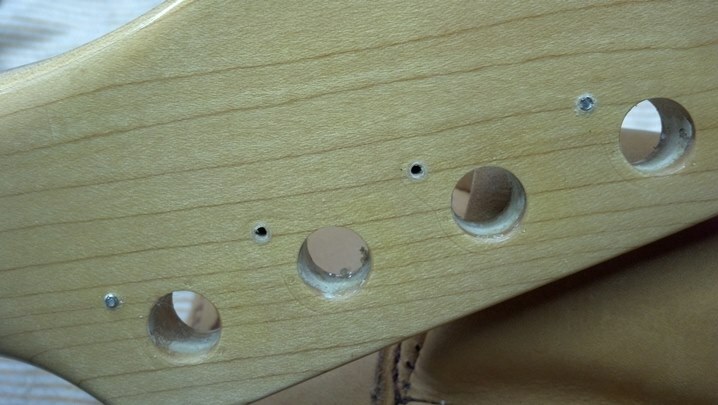 These holes are reamed to the proper size for the Correct screws. 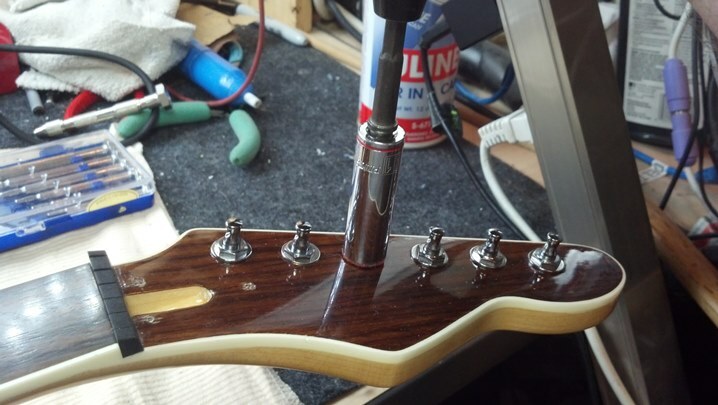 The tuners are going on! 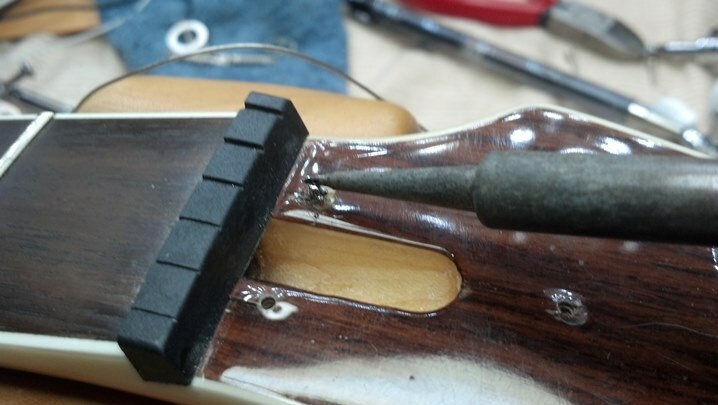 A bit of red felt is glued to the face of the socket so that the finish is not marred. 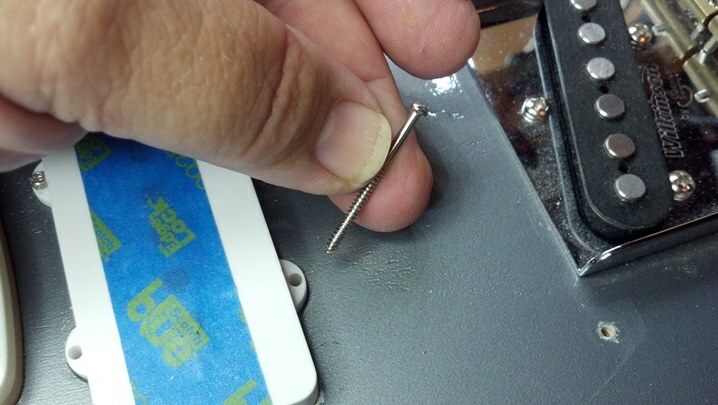 These new screws going into the correctly-sized holes are very well-behaved now. 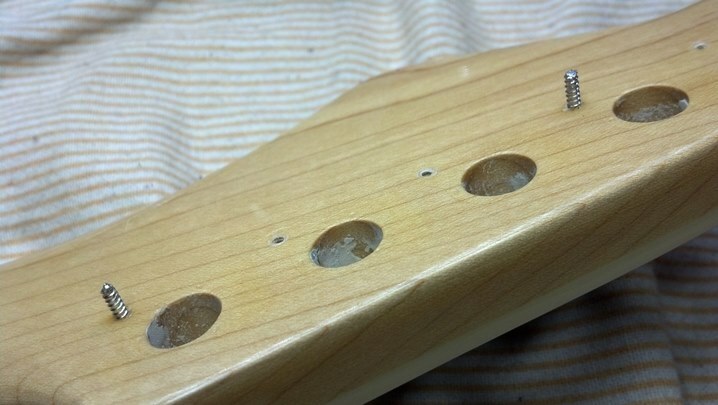 The truss rod cover screws will now live in properly-sized holes as well. The pin vise is getting a workout today! 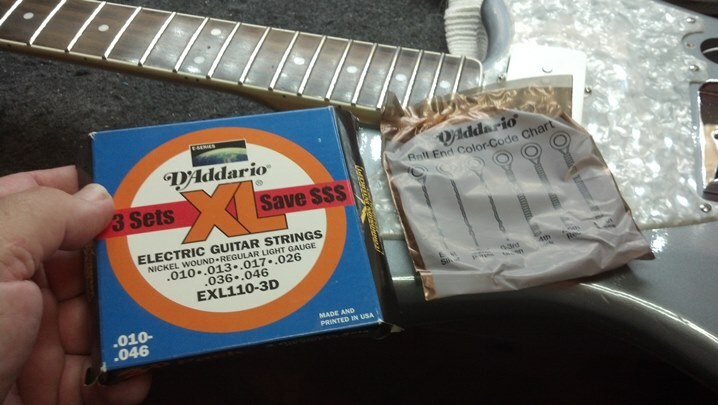 The customer uses these strings. 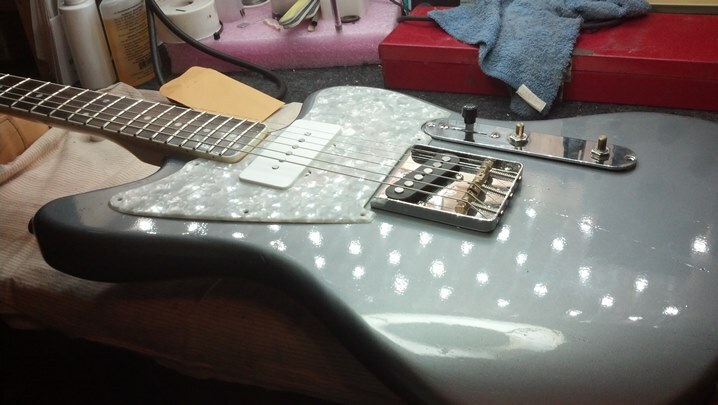 We need the guitar strung so that we can get the neck straight. 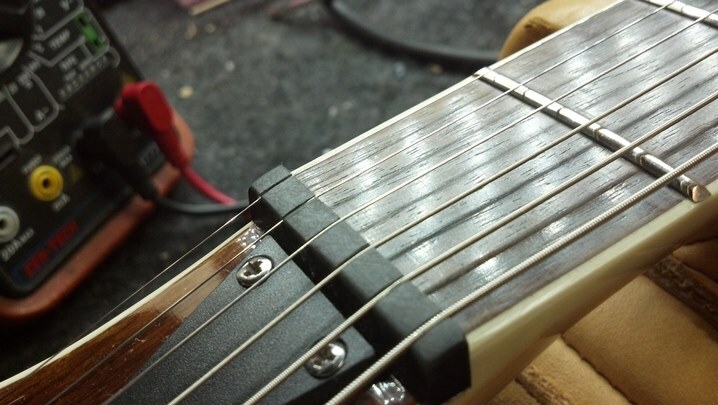 Note that the outside E strings are equidistant from the edge of the fret board. 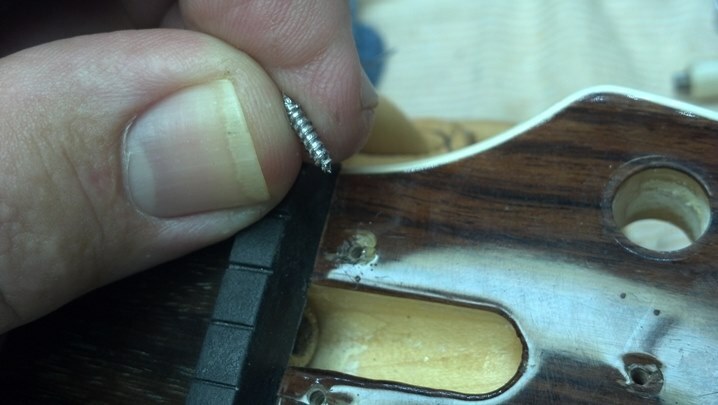 The screws attaching the neck to the body are tightened at this point. 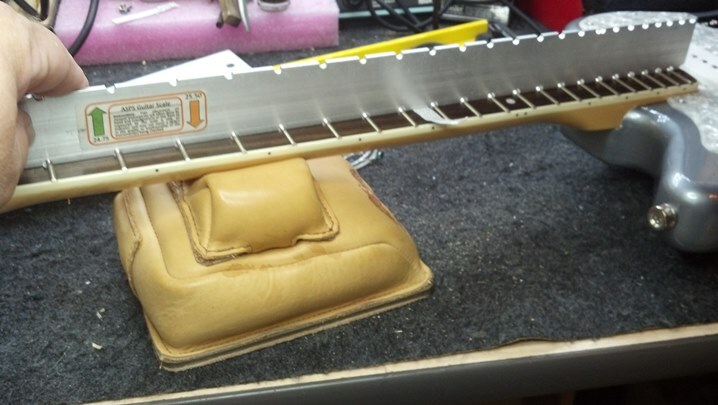 Now that the neck is properly positioned, we can finish the setup. 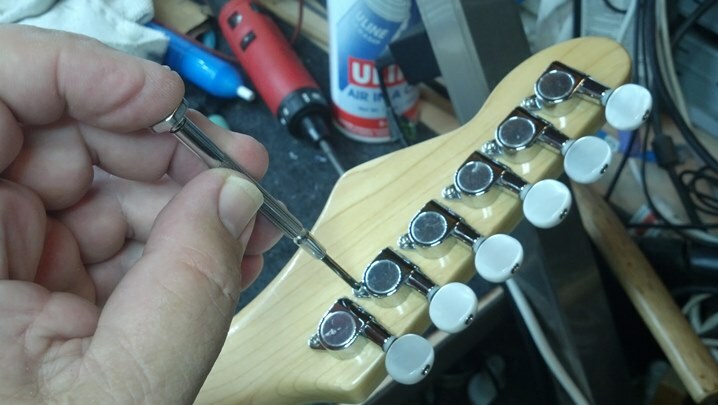 The truss rod is adjusted to make the neck perfectly straight. 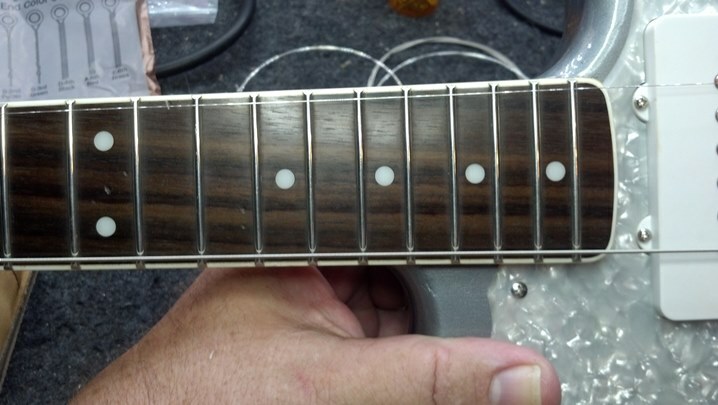 Do you see the slip of paper next to fret 9? 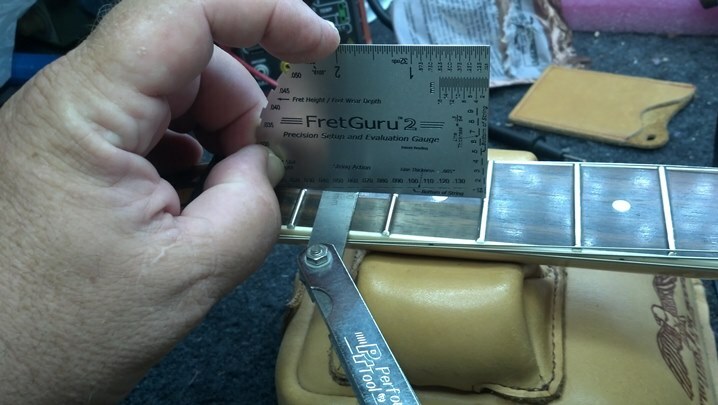 It is used as a feeler to see that the ruler is in contact with the fret board all along the neck. A piece of paper is about 0.0015 inch thick or so. 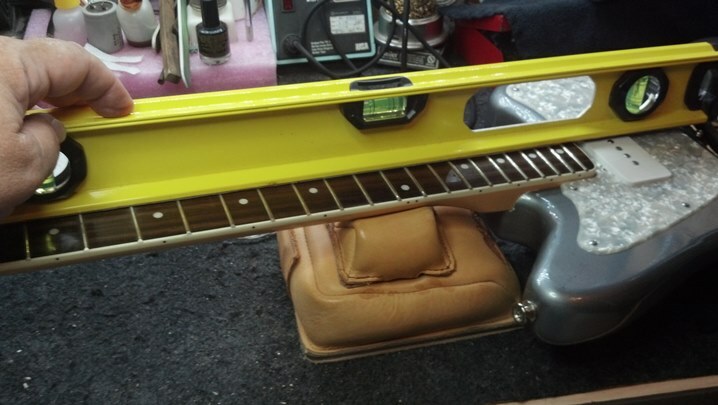 It is used to check for fit between every fret on the fret board. Yes, that makes a difference! 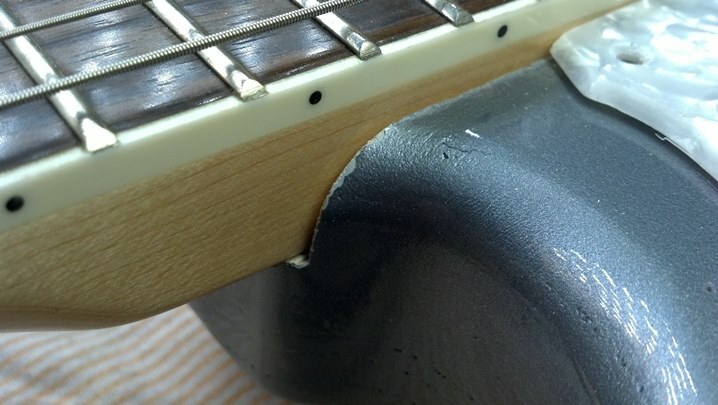 This neck is brand new, and so the frets had never been leveled. Just a tiny bit of sanding was all it took. 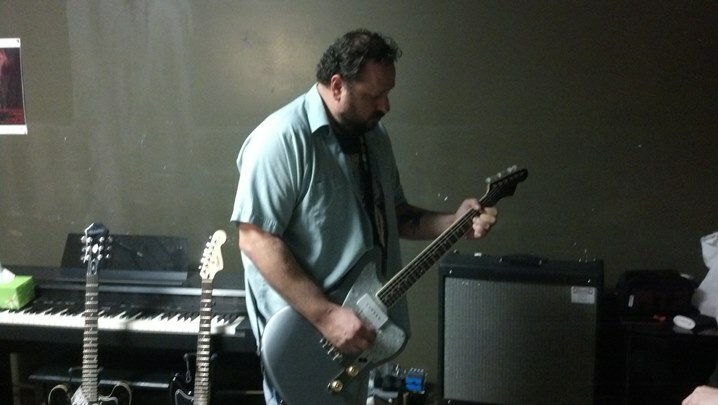 Here I am taking a measurement of fret wire height. I need this shortly to file the nut slots. 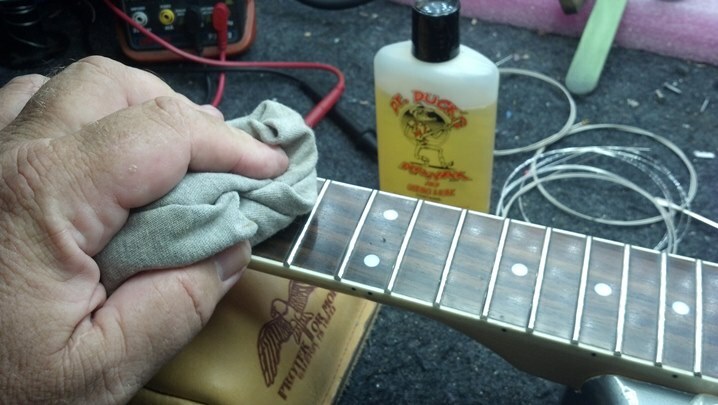 Fret board is cleaned and conditioned with oil. 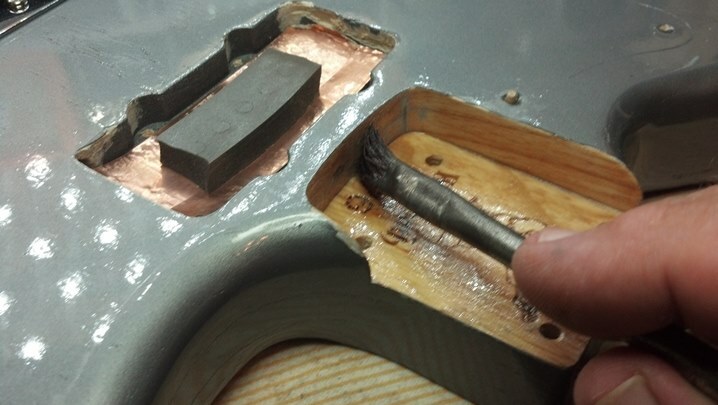 Once the nut slots are at the right depth, the rest of the nut is sanded away to make the slots shallow. 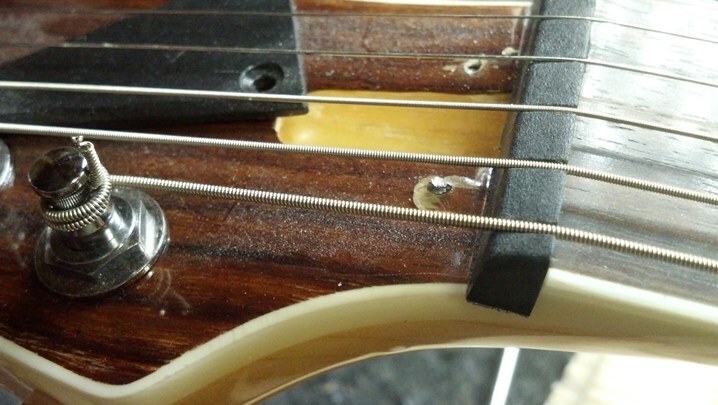 We need to sand a little bit more away near the high E and B strings, and maybe next to the D string. We’re getting there! 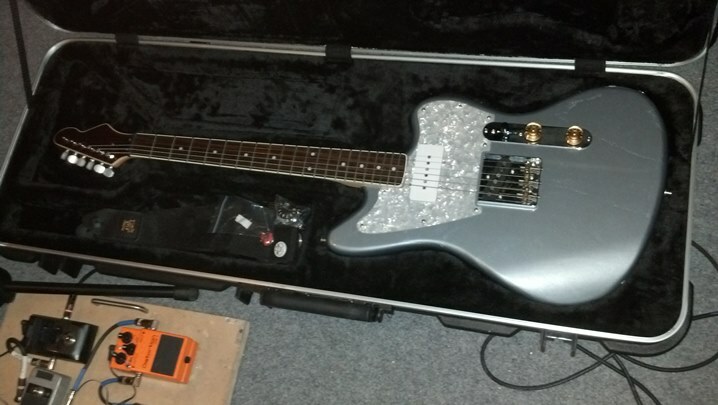 The instrument is back together and sounding good! 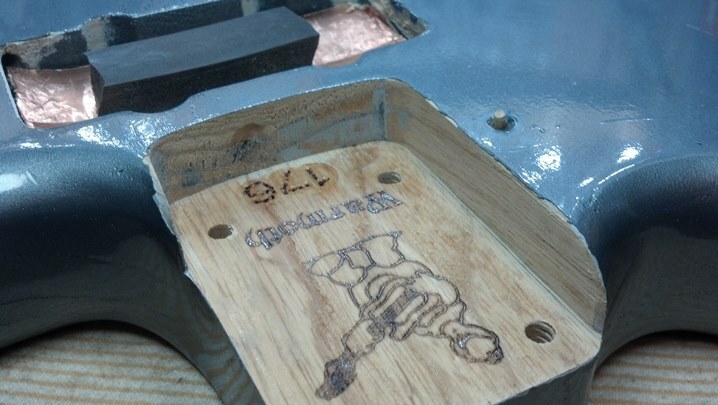 This is a closeup of the saddle barrels. These are factory intonated and are VERY close to correct. How do they do that? Our patient is making her debut at the studio.